Roland Sands was keen on customizing the Indian Scout into the RSD Scout from the day he laid his eyes on the machine. Indian Motorcycles launched the Indian Scout in 2015, at the Sturgis Motorcycle Rally. 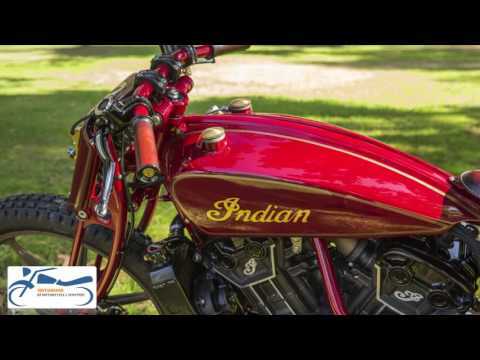 Indian Scout is a modern cruiser with light weight chassis. It has a 1133cc liquid cooled V-Twin engine that churns out 100bhp. Seeing the Indian Scout at Sturgis, Roland and his team decided to build a custom Indian Scout machine based on it. They wanted the water cooled V-twin engine to power one of their next builds. They got the opportunity when one of Roland Sands customer ‘Thor’ expressed a desire for the custom Indian Scout. Roland Sands Design team had earlier built the RSD Track Chief for him. In 2015, Roland Sands showed the raw version of the RSD Scout to the world. At the 2016 Wheels and Waves festival in Biarritz, France; Roland showcased the finished RSD Scout. The bike was flown from California to France for the festival. Everyone loved and appreciated the Indian Scout in its new avatar. As per Roland Sands, the Indian Scout is cool stock machine. From his eyes of a custom bike builder it seemed a lot of work. After seeing his work on this machine we just agree to his words. Every fan of Indian Motorcycles knows that the company’s heritage lies in racing. With this build RSD has just carried the racing heritage forward. In its original form Indian Scout is a cruiser. The RSD Scout is a bike that looks into the future and retains at least 15% of Scout of the past. The raw and unpainted version of RSD Scout, was actually taken to the Burning Man festival in 2015. Thor picked up the bike from RSD’s garage in California and rode it all the way to the Black Rock City. The hand built and re-engineered scout had everything raw. The bike had exposed wiring with the zip ties holding the cooling pipes and radiators in their place. It was a complete madness and with just 20 miles on the odometer, Thor rode the RSD Scout. To this RSD only says, “It’s safe to say madness is an inherent part of many of our projects.” After all nobody takes their brand new motorcycle straight to a custom bike builder’s garage. RSD Team is one of the few who will do that with smiles on their faces. Roland Sands Design team built a frame made from ChroMoly for the RSD Scout. The frame is similar to their Project 156 build. In comparison to the stock Indian Scout frame, RSD Scout’s frame is lightweight with much more aggressive geometry. It is a shorter frame with less rake angle. The team decided to use the same rear suspension (of Project 156) as the geometry of the suspension had already been perfected by the team on 156. Roland Sands wanted the RSD Scout to be an inspiration from the past and at the same time increase the performance levels. In my opinion he has done that fantastically. The ChroMoly girder fork dominates the front of this bike. The team built these front forks from the scratch. The team built a new radiator for the RSD Scout and also sorted out the looks of the cooling system. For all the electronics the team built a faux oil bag. The RSD Scout has a stainless steel exhaust that uses the existing RSD ‘Track’ muffler components. The ‘Track’ muffler is a Roland Sands Design product. The rear shock absorbers are Ohlins, the shocks that we generally see on a mountain bike. Airtrix did the paint job for sheet metal with hand-turned gold leaf accents. Airtrix had to match the vintage Indian Red color powder coating that is visible on the frame, forks and the swing arm. From the paint job to the new frame and the exhaust, everything fits perfectly on this bike. It is like a symphony that Roland Sands has created. Here are the pictures of the final build. Do check out the details and admire the sweat and hard work that has gone into it.